Yellow pigment very stable with a vegetable origin (roseda luteola L). 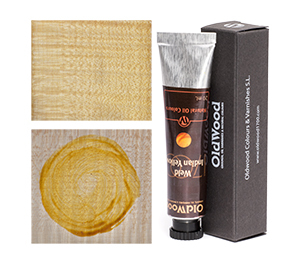 A very transparent, deep and luminous yellow pigment with a touch of orange. The original Indian yellow pigment was brought from Persia to India in the 15th C. It is an organic material (magnesium salts derived from euxanthic acid), taken from the urine of bovine animals fed with mangos. In the early 20th C. its production was outlawed in order to avoid cruelty to animals and also because of the Hindu beliefs. It is a pigment of incomparable transparency and luminosity, with a deep orange hue and a fluorescent green that becomes into gold. OLD WOOD has used its name for Weld – Indian Yellow name, which is vegetable origin (Roseda luteola L.) from the resedaceae family. The Roseda luteola, also known as weld, comes from the Latin luteola, meaning a yellowish which is associated with certain flowers colours. Known in prehistoric times and mentioned by the Pliny, it was used widely in Europe, especially during the 15th and 16th C. in Italy, Spain and France, as a very stable dye for wool and silk. The dye compound is luteolin, a flavonoid (flavone) with the chemical structure of phenyl benzopyrone. 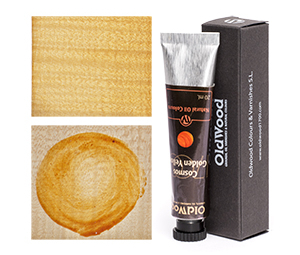 OLD WOOD offers a very transparent, deep and luminous yellow pigment with a touch of orange perfectly complementary to the deep reds by proximity and to the purples by opposition. 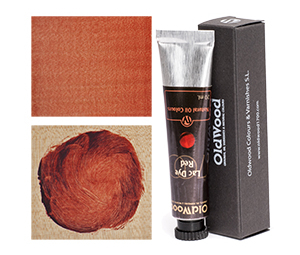 Originating in Asia, it was much appreciated in Europe in the 15th and 16th C. as a bright red dye.